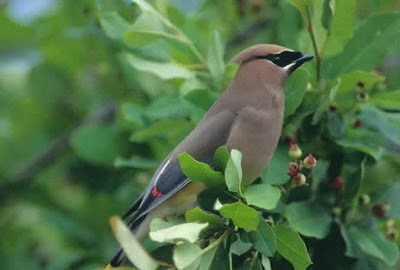 The release of the Cedar Waxwings, scheduled for yesterday, was put off until today on account of yesterday's unfavorable weather. Channel 12 (NBC) was there and I will post their video as soon as it's up; meanwhile, here's a video from the Richmond Post Dispatch telling the whole story. Scroll down in the box just right of center listing available videos. What isn't shown is, we popped the cork on a bottle of the bubbly and toasted the birds and Amber. Both the Department of Game and Inland Fisheries and an ornithologist from Cornell had warned Amber that if she could manage to save 5 of the birds, it would be an outstanding triumph. But 1 was the predicted outcome, they said, and she should be happy if she could pull that off. Well, two weeks ago, she released 4, and today she released 16 more. The other seven will need a couple of more weeks in rehab. She also has 3 Great Horned Owl chicks we got to see. They're still downy babies, but huge already. These are somebody else's, but Amber's look just like them. Me? So far I just have squirrels, but today I relieved Chris of two of her 30. They are two girls the same age as Puer and Puella. I can't take another thing until late May, due to other commitments. 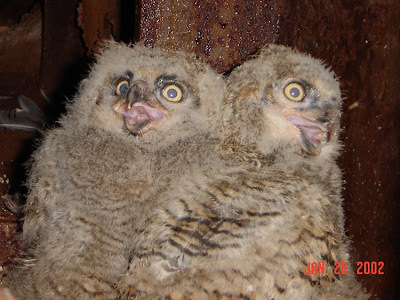 I love those owl chicks !